Brave. Be brave enough to take risks. This is where it all starts. It takes guts to even think about starting a business. PERIOD! Authentic. Be authentic enough to follow tried and true business practices. Don't hide your vision or goals. Remember businesse is about hard work, discipline, and the strength to learn from disappointment or failure. Loud. Be loud enough to attract serious attention. Know that everything is a reflection on you and be consistent. Lovable. Be loving enough to care. Build relationships, reward success, turn customers into fans. Spunky. Be spunky enough to do things different. Do the unexpected, follow your instincts, confidently innovative. !GO! Be inspired and excited to GO! and make something happen. Start doing something! There are a lot of different books out there on starting a business, success of a business, making your business better. This was the FIRST book I read, so it is special to me (plus it was a gift from my mom). I love this book because it pumps me up when I am feeling frustrated in my business. What do you to fire yourself up and get back on the track of success? FIVE MONTHS!! I can't believe how much time has past. I have a ton of excuses, but I believe you can only give one excuse, ever. Whenever anyone give me more that one excuse, they lose me. For example: "I am sorry I was unable to help you move. I was sick." Alright...I am bummed you couldn't help. I hope you are feeling better. That is a valid excuse. Now,on the other hand...example: "I am sorry I was unable to help you move. I was sick, then my boys had a game, I had to clean my house...blah, blah, blah..." This scenario does not make me feel good. So, my excuse for not blogging.......I didn't see the point. No one is reading this, why bother? 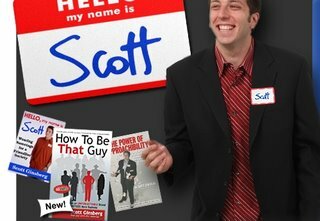 That was until I came to Chapter 15 in Scott Ginsberg's book, How to Be That Guy. He is that nametag guy (www.hellomynameisscott.com). Anyway.....Chapter 15 is titled, "If You Don't Have a Blog, You're a Putz!" Well, I am not a putz and I do have a blog. I just do not use it. Thank you Mr. Ginsberg for inspiring me to try this blog stuff out, again. Welcome to my blog....Let's see where this goes. How do you feel about excuses? Have you ever made a change after an excuse?